I rarely ever have the opportunity to have my photo taken by someone else, so I jumped at the chance to have my photo taken by Autumn Ashdene. I’ve always admired her photography for it’s rich colors and distinctive style, much different than my own. I really liked how she gave Gogo an extra pouty pout! If you’re interested in commissioning a photo, check out Elysé studio! Elysé is a new photo studio co-owned by Autumn Ashdene & Elizabeth Dickinson. 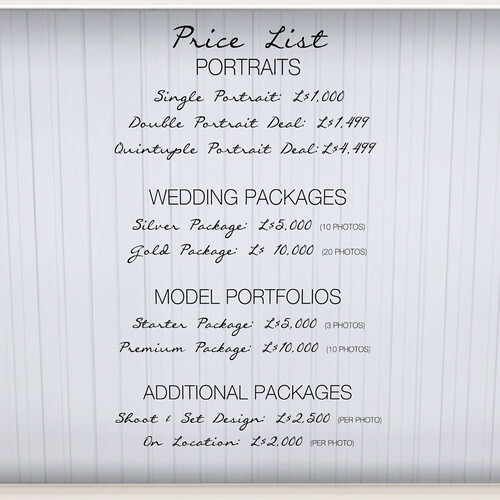 I’ve posted the price list below, and also contact info if you want to get in touch and make an appointment! I would hurry before they’re completely swamped with requests. Specialising in portrait and profile photography, as well as modelling portfolios and wedding packages. Contacting Autumn: [email protected] / plurk pp @ autumnashdene OR an NC for fast-track reply. Contacting Elizabeth: plurk pp @elizabethdickinson or an in world NC. Plurkies, you get a slight discount if you have these talented ladies on your timeline! I didn’t know her, she did a great job with this picture. What a stunning picture! Very beautifully done! I’ve known Auta for a very long time. She is one of the most talented artists, in style and technique, that I have ever known. I love her to bits and although a bit biased, I promise you will not be disappointed if you get a photograph done by Elysé!